Losing most of its visual wow on the small screen, watching this weak 'toon adapation at home, it will only seem less interesting, more pre-fabiricated and probably more boring. Sucking all the "classic" out of Robert Louis Stevenson's "Treasure Island" and filling the void with sci-fi video game graphics and Disney-fied adolescent angst, "Treasure Planet" is literally nothing more than a cartoon caricature of its inspiration. Aiming squarely at cool-conscious pre-teen boys, writer-directors John Musker and Ron Clements ("Hercules," "The Little Mermaid") have re-imagined young hero Jim Hawkins (voice of Joseph Gordon-Levitt) as a sullen space delinquent from a broken home who sports a bad '80s pony tail and idles away his time "solar surfing" on a jet-engine sailboard and getting in minor scrapes with robotic cops. That is, until a 3-D holographic treasure map falls into his hands, revealing the location of the fabled Treasure Planet where a space pirate hid all his booty. "This could be the answer to all our problems," he insists to his struggling, bistro-running single mom. So Jim sets off on his grand adventure in an old-fashioned but space-faring, three-mast, solar-wind-powered sailing ship that has been hired by nerdy, Goofy-reminiscent Dr. Doppler (voice of David Hyde Pierce) -- an alien astrophysicist and a regular at the diner who is trying to win the affections of the boy's mother by taking him under his wing. 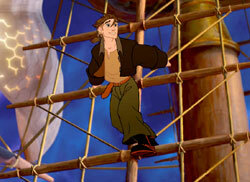 But personality-wise, "Treasure Planet" has only one highlight: Long John Silver...the cyborg. The treacherously chummy galley cook and incognito pirate, who takes a shine to young Jim before double-crossing him for the treasure, is a vividly portentous character (in every sense of the word) with a laser-beam eye (instead of a patch) and high-tech, gadget-packed Swiss Army prosthetics (instead of the customary hook hand and peg leg). With a deep, ominously duplicitous voice, courtesy of stage actor Brian Murray, Silver brings the picture to life when he's on screen. Unfortunately, sitting right there on his shoulder (where a proper pirate would have a parrot) is an example of how "Treasure Planet" goes wrong. The villain's little alien companion called Morph is a frisky, floating bubble-being (clearly designed to sell plush toys) whose shape-shifting abilities are employed mostly for cutesy-poo comic relief. Once our adventurers find Treasure Planet, they pick up a rusty robot sidekick of their own, with the gratingly hyperactive voice of Martin Short, which only makes matters worse. The film has its clever moments (Morph becomes a cream pie and throws himself in someone's face) and it's spirited enough to satisfy its target audience. But despite the unusual setting and the literary inspiration, the Disney gang has panel-beaten the story to fit their assembly-line mold -- and when they do color outside the lines, it's in a hapless attempt to up the "cool" quotient. Examples? The soundtrack is plied with awful alt-rock interludes and the dialogue peppered with fading slang phrases like "We are so outta here!"